• Rome trip should be welcomed | Is The Pope a Catholic? « • Irish Bishops in Rome – more than one view needed? Ok – so I’m Catholic! Yep, I really believe the Church was founded by Christ and that by the power of the Holy Spirit, He acts through it, in spite of all its human failings. So, sure, I’m coming at this from a definite angle. But even allowing for that, am I way off in thinking that what happened in Rome over the last few days was, objectively speaking, worthy of some welcome? Surely it’s a sign of a Church genuinely trying to address the problem of serious failings in the way child abuse was dealt with? Garry O’Sullivan, Editor of the Irish Catholic newspaper said on Drivetime (RTE Radio 1) that the bishops were really surprised when they heard how the meeting was being received at home, and he himself was surprised too. The statement issued by the Vatican Press Office afterwards (http://www.zenit.org/article-28373?l=english) acknowledged the “failure of Irish Church authorities for many years to act effectively in dealing with cases involving the sexual abuse of young people by some Irish clergy and religious.” The statement spoke about “significant measures have now been taken to ensure the safety of children and young people” and about the bishops “commitment to cooperation with the statutory authorities in Ireland – North and South – and with the National Board for Safeguarding Children in the Catholic Church in Ireland to guarantee that the Church’s standards, policies and procedures represent best practice in this area.” I have to say I was pretty encouraged by this – especially in the light of Archbishop Martin’s reminder today that the visit is only one part of a process. But listening to the coverage of the visit today, I couldn’t help but think that maybe some of the voices being heard were pretty determined not to acknowledge any positives no matter what was said or done at the meeting. I can understand this from survivors of abuse – what can anyone say or do that will take away the pain of what they’ve suffered? But surely the media have an obligation to try to represent a broader range of views, and therefore to acknowledge that the bishops trip to Rome represents a genuine effort to at last do the right thing? It doesn’t look like this is going to happen any time soon, so the Church will have to continue on its journey of renewal despite this. This means, among other things, that it will have to find alternative ways of communicating directly with the ordinary faithful. I think the media in Ireland are uninterested in representing a broad range of views. They are interested in selling papers and I’d say scandal in the Catholic Church ticks a lot of boxes for them. I’ve disregarded most of what they’ve had to say yet about the Rome visit, most of which has been speculation and conjecture. They are reporting with very little information about events that for the most part happened behind closed doors. I view the meetings over the past couple of weeks as very positive – first in Knock, then in Rome. One of the difficulties about the Catholic Church in this small country of Ireland is that there *seems* to be a lack of unity and communication between the bishops. We the people need to see a leadership of faith that works in unity. 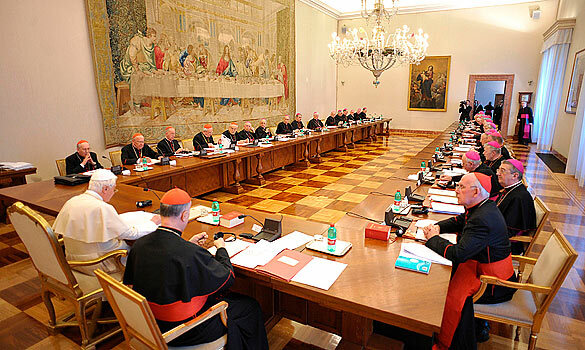 The Rome meeting is a sign of unity between the bishops and with the universal Church. This is a good thing. Some people speaking for victims of clerical child abuse (some of whom are victims themselves) have expressed anger and dissatisfaction that their requests for some specific clear statements by the Pope and finishing off of some bishops resignations were not met. To some extent I can understand their anger and frustration which arises from the horrible experiences they endured and the desire to have responsibility for that suffering clearly and unambiguously by the hierarchy. We don’t really know what was said behind closed doors. I do hope and trust that it will lead to effective action towards the ongoing protection of children, and promoting a stronger unity and a vibrancy of faith here. Keep up the blog, Petra, it’s great to see. It would indeed be great to see bishops and priests using internet tools such as blogging – it would be an ideal tool for them at the moment when it’s rare to hear any support for anything the Church is doing and little or no mention of work already done. Maybe workshops for clergy and others on how to use them would be an idea? Your mention of what was said behind closed doors is an important one: as well as this meeting being just one part of a process, it seems clear that much, even most, of what was discussed in Rome this week was not released to the media and will probably only become apparent as time passes. Bishop Willie Walsh is the only Bishop I could see blogging tbh or maybe Archbishop Martin if he had the time! I think people are probably puzzled as to what bishops actually do, apart from turning up at confirmations and tiresome diplomatic meet and greets. With regard to media reporting, the press were similarly slanted against public servants, which was very unfair. Mind you with nearly everyone writing against the bishops it is difficult to stand in opposition to that general [published] concensus without a lot of self questioning. If bishops want to connect with the rest of us [I refuse to use the words ordinary laity] they need to drop the church speak as Marie Collins says and just speak as they would to anyone when they are not at a press conference or whatever. Bishop Micheal Smith at least had the courage to say that he initially had reservations about the Rome visit, which was interesting. on February 21, 2010 at 21:57 | Reply • Culture of negativity? « Is The Pope a Catholic?